I used internet automation service IFTTT to simplify my 180 blogging habit. This post may also give you ideas for other ways to use IFTTT. 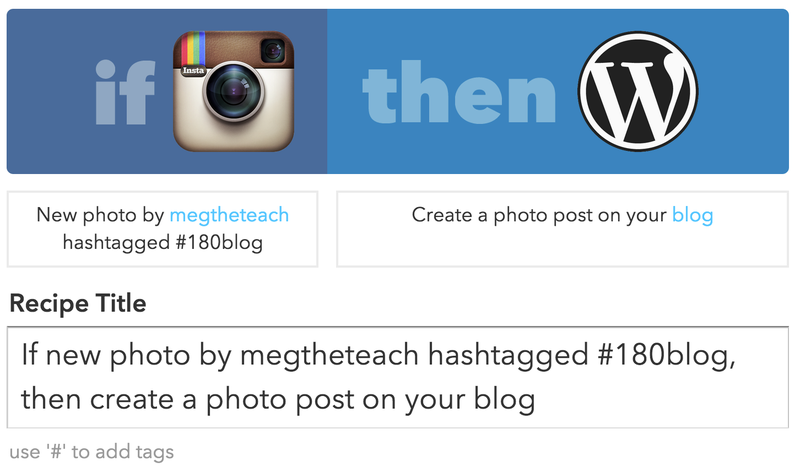 If I post to Instagram with the hashtag #180blog, grab the photo and post it to my WordPress 180 blog. Do a little formatting in the transition, too. Here’s how I created the recipe and the details are below the video. Fun fact: this post was created automatically using <a href="https://ifttt.com/recipes/304209-post-to-180-blog-from-instagram">a recipe I programmed on IFTTT</a>. It grabs all my Instagrams hashtagged with #180blog and auto-publishes them. See the HTML code in this Caption? That’s how I formatted the WordPress post with line breaks and added some text explaining how I set the whole thing up. I’m finding Instagram is easier to use than the WordPress app, plus I like having Instagram get these photos as well. I didn’t make any settings for Categories or Tags. Post status is set to Publish immediately. I need to edit my recipe to also grab video posts as well as photos. Last week, I published a video that didn’t trigger my recipe. Upon re-reading my recipe, I see now that it’ll only trigger after a photo is detected. Even so, it wasn’t a big deal to edit the subsequent post to include a video. I wish that I had a little more flexibility in titling the WordPress post. Today, I’m using a full timestamp in my title. I’d prefer to edit it down to just the date without the time. I think the feature request in making is that IFTTT should allow the user to parse some data fields. The wheels feel off my 180 blog this past January when I was overwhelmed by teaching and robotics coaching duties. This IFTTT recipe helps only with number 3. I have an alarm on my phone to remind me about number 1. I gotta be honest though and tell you that number 3 is sometimes just too much. Starting in August, my new goal is to publish an uncaptioned photo if that’s the only thing standing in my way to publishing daily. Thanks, Julie for requesting I write this post!